America's Most Disgusting Stadium Food: Are You Eating It? (CBS) Indigestion? That might be the least of worries for the millions of fans who chow down while attending pro sports events. 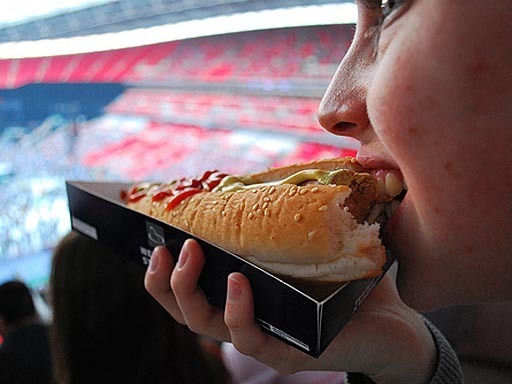 A new report from ESPN reveals critical health code violations at the food vendors who dish up hot dogs and other favorite fare at pro sports stadiums and arenas nationwide. Violations ranged from dirty equipment to insect infestations to mouse droppings. Sounds yucky. But is the filth jeopardizing the health of sports fans? Chris Waldrop, director of the Food Policy Institute at the Consumer Federation of America, says the report " tells consumers that they should be very concerned about some of the food that they are eating and purchasing in a lot of these stadiums," ESPN reported. Some of the nation's arenas fared worse than others, according to the report, which looked at violations at all 107 North American arenas and stadiums that host Major League Baseball, National Football League, National Hockey League, and National Basketball Association games. How does your home-team stadium stack up?